it's all one thing: More Asian and Native American public domain heroes: the Green Turtle, Fu Chang, Dr. Fung, Mantoka—plus villains! 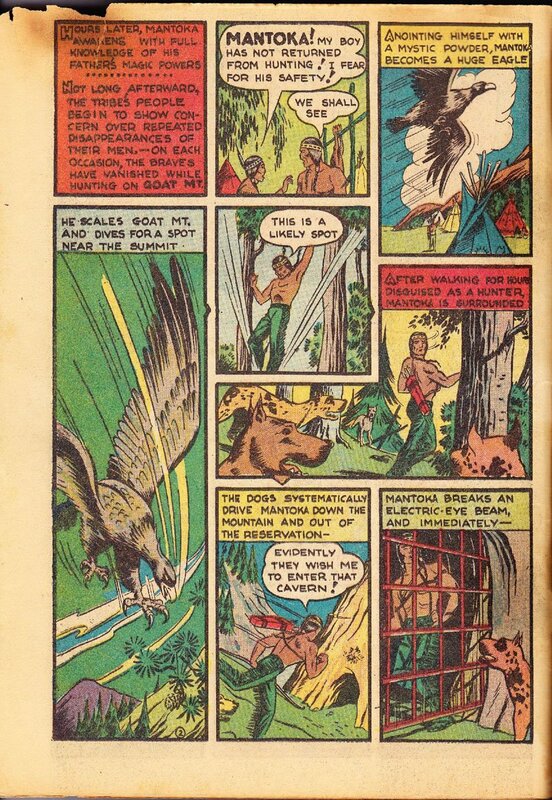 More Asian and Native American public domain heroes: the Green Turtle, Fu Chang, Dr. Fung, Mantoka—plus villains! 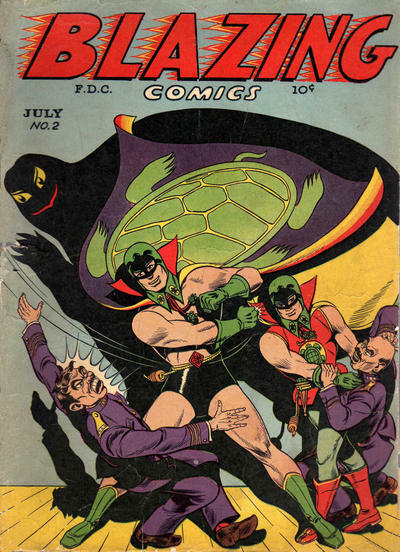 Green Turtle: "A true mystery man, the Green Turtle aided the Chinese in guerrilla warfare against Japanese invaders. He wore a green cloak with an enormous turtle-shell design and had a sidekick, Burma Boy, a young beggar he'd rescued from execution by the Japanese army." Fu Chang: "Fu Chang was a Chinese American living in the Chinatown district of San Francisco. While he dressed like a modern American outside his home, he dressed in traditional Chinese clothes at home. He was also a devout worshiper of the ancient gods and because of this was given a set of magic chessmen by the elderly magician Sing Po, a direct descendant of Aladdin. These chessmen possess the same magic of Aladdin's lamp and can be brought to life to serve Fu Chang. He uses them to help him fight crime in San Francisco. He is also aided by his sweetheart Tay Ming." Highly recommended: Gene Luen Yang on the illustrious and superlative fu chang. Dr. Fung: "Dr. Fung was an old, scientific detective who traveled the world solving crimes, with the aid of his young American assistant, Dan Barrister. 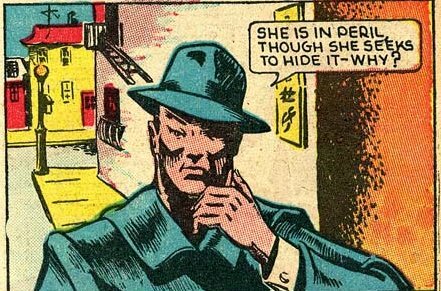 ... Dr. Fung was a brilliant detective, versed in the sciences of both the east and the west. Although an older gentleman, and usually relied on Barrister for muscle, Dr. Fung proved useful in a scrap and handy with a gun." 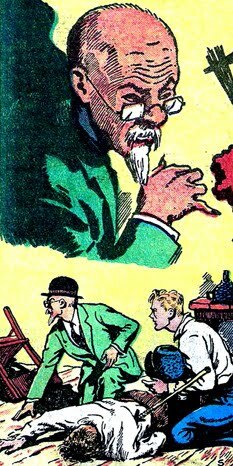 Golden Age Heroes: Friday Frightfest: MOTHER HUBBARD & DR FUNG! A magic, shape-shifting Shaman, who could alter himself (size, density, become animals) and the physical world. 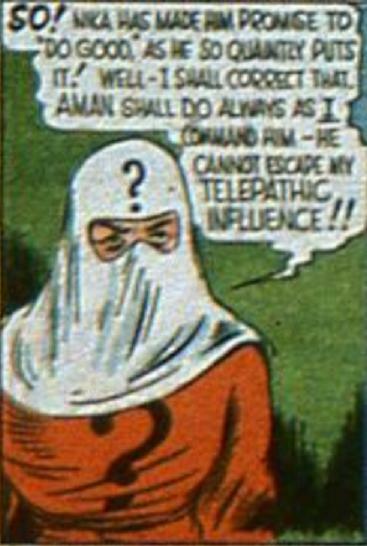 He only made two appearances, but I'm sure that given time, he could have been comparable in power to Stardust, Fantomah, The Sorceress of Zoom. A sort of anything goes character. Great Question: "The Great Question was a member of the Council of Seven at the lamasery in Tibet where Amazing Man was raised and trained. He was the lama in charge of interrogations. 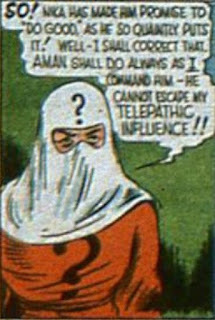 With his incredible telepathic powers he could project his thoughts across the world and hypnotize all but the strongest mind. Great Question was able to use his resources and abilities to create a world-spanning criminal organization." Nang Tu: "Nang Tu was a sorceress and high priestess who guarded "The All Seeing Eye," a fist sized diamond on the forehead of the giant Khotan Buddah statue, located in the hidden "Temple of the Man-Eating Spider," somewhere in the Himalayas, a few days climb from Kathmandu. Nang Tu appeared to be killed in personal combat with Merlin when he came looking for the All Seeing Eye. The extent of Nang-Tu's power is unclear, but she was immune to Merlin's magical spells, and Merlin was forced to call upon the strength of 10 men in order to subdue her in combat. She had razor sharp claws and fangs, and carried a double pointed metal spear. She commanded a team of female archer warriors. She may have also controlled the giant spider Angor."